St Faith's Church is the principal Church of Havant, Hampshire. The Church is dedicated to St Faith of Aquitaine, the girl martyr, the dedication dating from the eleventh Century. 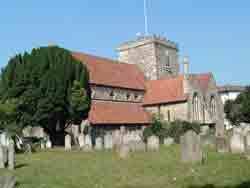 A church has existed on the present site for about nine centuries. There is nothing remaining of the original Saxon or Norman church, as far as is known, though it is likely that some of the original stonework was reused in the present building. Some of the brick in the wall is probably Roman. 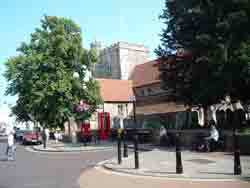 Havant itself has Roman history and the Church stands on a Roman Road. Also, when the Church was repaired in 1832 it was found to be standing, in part, on Roman foundations. I visit the Church frequently, for reasons explained below, and, consequently, the Church has come to mean a great deal to me in many ways. Just how and why will become apparent when the first part of the story of Lorelei and I is finally published, along with the sequels, though some is already on my Web Sites and more will be published on the Internet and, thanks to developments during the summer of 2005, on television and other parts of the Media..
As a result of my visits, I am well known to a number of the people involved with the Church, including Vicky, the Verger and Reverend David Gibbons, the Rector, who I have found to be quite broadminded with a bias towards spirituality rather than strict dogma. While it would be entirely appropriate to address Members of the Church as "Ye, of little Faith", that would only be true in terms of the diminutive stature of the Church's Saint. I have always found them very pleasant and invariably try to visit the Church when the have events such as Havant Town Fair which centres on the Church and is held in August. My involvement with St Faith's Church dates from the early 1990s. it really began when someone suggested that I burn the then very early version of "Remembering Lorelei", an autobiographical book, still in manuscript form for reasons explained elsewhere, that I have written. That suggestion came from someone who, while well meaning, did not fully understand the situation, or Lorelei. Kate Lomax, a local psychic, suggested I spend some time in St Faith's, go to the top and ask if that was appropriate. I did so; the answer to whether I should destroy it was a resounding "No". In fact, the emphasis was very much that the book should go ahead. Unfortunately, circumstances in Hampshire have delayed the book for years, along with other positive developments for Havant, Hampshire and the south and east of England in general, as well as Germany. Those events caused my family and myself a great deal of stress. So, although my connection with St Faith's Church started with developments on my non-physical, spiritual, side, I visited the Church on numerous occasions for other reasons as well. I have never been to a service at St Faith's; I do not feel I need to do so, it is not my way, though it is entirely appropriate for those whose way it is. However, the connection, in that sense, with St Faith's has held over the years and continues to this day. From June to October of 2004 my mother was terminally ill in Stoke Mandeville Hospital. I visited her every weekend and spent time in St Faith's in connection with those events as well. It helped considerably for reasons and in ways it would take too much space to explain here. Over the years I have had many experiences in St Faith's. some minor and gentle, some spectacular. With one exception none were unpleasant, though this is not the juncture to go into that particular event. I had many hours (thirty to fifty hours, depending on definitions and other considerations) of pre- and post- death experiences with my mother, a few o them in St Faith's. Part of the reason for visiting the Church is an appropriateness. such buildings are imbued with the use to which they have been put, along with those who have used, occupied them. the feeling in St Faith's is not as great and tangible as the Mother Chapel in Chichester Cathedral, for instance, but pleasant, soothing and calming all the same. Because of my relationship with the Church i wished to contribute to the Restoration Fund, as well as in ohter ways. That is outlined on my Thoughts and Projects page.